You're likely quite shocked to discover that action verbs show action. Okay, you probably already guessed that. The question is, do you know what kinds of actions they show? They can show action in three ways, and you're about to learn all of them! An intransitive verb does not transfer its action to someone or something. There is one type of intransitive action verb: intransitive complete verbs. A transitive verb transfers its action to someone or something. There are two kinds of transitive verbs: transitive active and transitive passive. 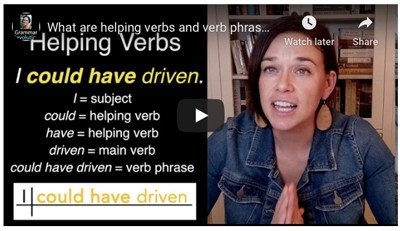 Let's take an in-depth look at these three types of verbs! Intransitive complete verbs are action verbs. Did you know that the prefix in- means not? That is a helpful tidbit when it comes to understanding this verb type. INTRANSitive complete verbs do NOT TRANSfer action to anyone or anything. They show action, but they are complete all by themselves. Notice that the boy didn't laugh something, and he was not laughed. That would be strange. My sister didn't sneeze something* (that would be gross), and she was not sneezed. When I was in second grade, Mr. Penny was reading us one of The Boxcar Children books during story time. I was completely engrossed in the story when suddenly Leah Krentz accidentally sneezed apple onto my leg. Yes. She sneezed apple. That was gross, and in that case, sneezed was a transitive active verb. You'll be learning about that type of verb next. The dog didn't bark something, and he was not barked. As you can see, intransitive complete verbs don't transfer their action to anyone or anything! 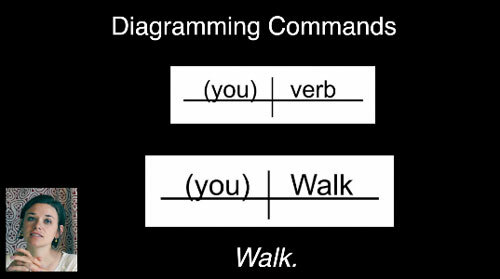 Here is how you would diagram an intransitive complete verb. 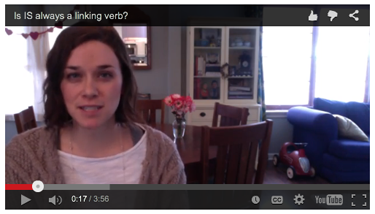 Transitive active verbs are action verbs. The dog scratched its back. The wind rustled the leaves. TRANSitive active verbs are action verbs that TRANSfer their action to something or someone. The subject always performs the action with this kind of verb, and the verb's action is always transferred to someone or something. Look at those example sentences again. Can you see that the subjects are performing the action? Can you see that the verbs are transferring their action? Good! The someone or something that receives the action with these verb types is called the direct object (ball, back, leaves). Transitive active verbs need direct objects. It's a fact. They are bound together like mac and cheese or peanut butter and jelly. In all of the example sentences, the subjects (Mark, dog, wind) are doing something (kicking, scratching, rustling) to someone or something (ball, back, leaves). All of those verbs show action, and they all transfer that action to a direct object. The ball is receiving the kick, the back is receiving the scratch, and leaves are receiving the rustle. That means that they are all transitive active verbs. 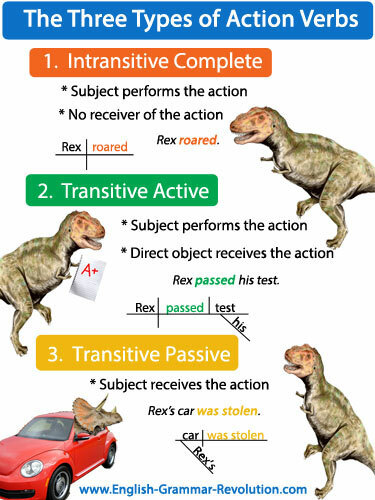 Check out this sentence diagram of a transitive active verb. The baby kicked the ball. Transitive passive verbs are action verbs. The dog's back was scratched. TRANSitive passive verbs also TRANSfer their action to someone or something. But, with this verb type, the subject is the one receiving the action, and sometimes we don't even know who performed the action! Look at those example sentences. Can you see that the subjects are all receiving the action? Good! Did you also notice that none of those sentences tell us who or what is performing the action? That's because this kind of verb doesn't have to tell us that information. If you want to include the doer of the action with transitive passive verbs, you do so in a prepositional phrase that usually begins with the word by. I'll show you what I mean. Here are those same sentences, but this time, you'll be able to see who or what performed the action. The ball was kicked by Mark. The dog's back was scratched by the dog. The leaves were rustled by the wind. Did you notice anything else about these verbs? Did you notice that these are made of more than one word? Transitive passive verbs are formed with a helping verb and a main verb. In all of the example sentences, the subjects (ball, back, leaves) are receiving the action. These types of verbs don't have to tell us who or what is performing the action, but they may do so in a prepositional phrase. These types of verbs are formed with the help of a helping verb. Here is how you diagram a transitive passive verb. Is is always a linking verb? I'll sing you a song about helping verbs! Do you like learning with videos? Now you know all about action verbs! Go back to the parts of speech page.